The 35th Congress of the German Society for Sociology takes place in Frankfurt am Main, October 11 - 15, 2010, under the title "Transnationale Vergesellschaftungen / Transnationalism and Society". Die transnationale Ordnung globalisierter Finanzmärkte: Was lehrt uns die Krise? (1) "Dissolutions of the Social: On the Social Theory of Luc Boltanski and Laurent Thévenot" in "Constellations" vol. 17 no. 3 (September, 2010), pp. 376–389. Originally published in Neue Zeitschrift für Sozialforschung vol. 5 no. 2 (2008), pp. 84-103. Also published in Axel Honneth's new book - "Das Ich im Wir. Studien zur Anerkennungstheorie" (Suhrkamp Verlag, 2010). See my post here. (2) "Liberty’s Entanglements: Bob Dylan and his Era" in "Philosophy & Social Criticism" vol. 36 no. 7 (September, 2010), pp. 777-783. Originally published in Axel Honneth et.al. (eds.) - "Bob Dylan - Ein Kongreß" (Suhrkamp Verlag, 2007). Conference on "The Epistemology of Liberal Democracy"
The second Copenhagen Conference in Epistemology was held August 19-20 at the University of Copenhagen. See the abstracts to all talks here [pdf]. 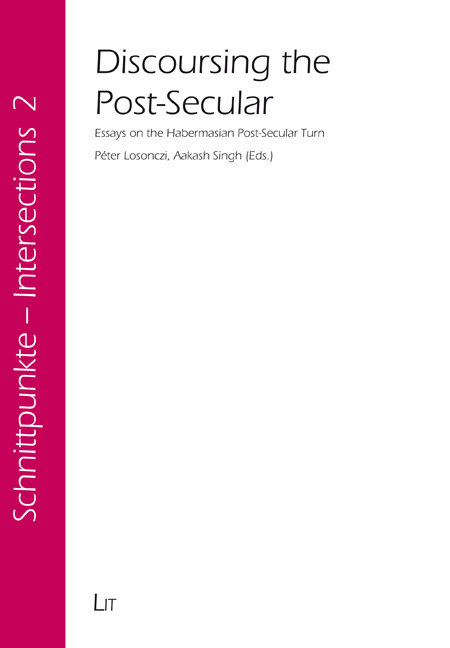 This collection of essays analyzes the Habermasian post-secular turn as it has been evolving over the last decade triggering intensive debates in social and political theory, but at the same time aims to situate the arising postsecular discourse(s) within the larger intellectual environment shaped by the complex influence of the alleged "return" of religion or the religious. The volume includes studies from as diverse fields as cultural theory, social theory, political philosophy, and theory of religion, as well as theology and bioethics. Key issues such as tolerance, the nature and challenges of modernity, pluralism, knowledge and faith, human dignity, ritual, idolatry or transcendence are brought into the discussion in an inventive way, and Habermas's work is reflected upon in comparison with figures like Levinas, Vattimo, and Agnes Heller. Péter Losonczi is Associate Professor at the Institute for Intercultural Studies at the University of West Hungary, Hungary. Aakash Singh is Research Professor at the Centre for Ethics and Global Politics at LUISS University, Rome, Italy. See also: Péter Losonczi & Aakash Singh (eds.) - "From Political Theory to Political Theology. Religious Challenges and the Prospects of Democracy" (Continuum Books, 2010). 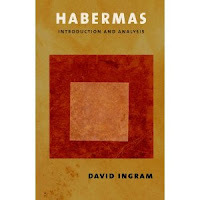 Ingram's book addresses the entire range of Habermas's social theory, including his most recent and widely discussed contributions to religion, freedom and determinism, global democracy, and the consolidation of the European Union. Recognizing Habermas's position as a highly public intellectual, Ingram discusses how Habermas applies his own theory to pressing problems such as abortion, terrorism, genetic engineering, immigration, multi-culturalism, separation of religion and state, technology and mass media, feminism, and human rights. He also presents a detailed critical analysis of Habermas's key claims and arguments. Separate appendixes introduce and clarify such important concepts as causal, teleological, and narrative paradigms of explanation in action theory; contextualism versus rationalism in social scientific methods of interpretation; systems theory and functionalist explanation in social science; and decision and collective choice theory. David Ingram is Professor of Philosophy at Loyola University Chicago. He is the author of "Habermas and the Dialectic of Reason" (Yale University Press, 1989). See David Ingram's article: "Of Sweatshops and Subsistence: Habermas on Human Rights" [full text, pdf], Ethics & Global Politics, vol. 2 (2009), pp. 193-217. 1. Humanity Before Human Rights. 3. 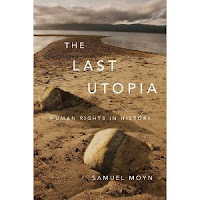 Why Anticolonialism Wasn't a Human Rights Movement. 4. The Purity of this Struggle. 5. International Law and Human Rights. 6. The Burden of Morality. 7. "Human Rights" in the New York Times. 8. Human Rights in the 1940s. An excerpt from his new book appears in "The Nation" (August 30 -September 6, 2010), entitled "Human Rights in History". Also see his "On the Genealogy of Morals" from "The Nation" in 2007. "The Fabric of Justice - Limits of Proceduralism"
"The article tries, in a first step, to show that the intrinsic fabric of justice doesn`t consist of distributable goods, but of commonly accepted social relations which are composed of morally loaded practices; in these practices those regards can be found which define what it means to treat another person in a fair or just manner. If this starting point is convincing, then some methodological consequences concerning the concept of justice have to be drawn which are presented in the second step: Instead of constructing a normative procedure which allows us to deduce the content of justice, we have to start by reconstructing the social practices which inform us about the respects of justice. The result will be, as indicated in a third step, a pluralisation of our concept of justice which includes as many relevant principles of justice as there are commonly accepted and appreciated forms of social relations." A German version is published in Honneth's new book "Das Ich im Wir. Studien zur Anerkennungstheorie" (Suhrkamp Verlag, 2010). A Portuguese translation is available online here (pdf). In "Rawls, Dewey, and Constructivism", Eric Weber examines and critiques John Rawls' epistemology and the unresolved tension - inherited from Kant - between Representationalism and Constructivism in Rawls' work. Weber argues that, despite Rawls' claims to be a constructivist, his unexplored Kantian influences cause several problems. In particular, Weber criticises Rawls' failure to explain the origins of conceptions of justice, his understanding of "persons" and his revival of Social Contract Theory. Drawing on the work of John Dewey to resolve these problems, the book argues for a rigorously constructivist approach to the concept of justice and explores the practical implications of such an approach for Education. Eric Thomas Weber is Assistant Professor of Public Policy Leadership at the University of Mississippi. The book is the first publication in the new Continuum Studies in Political Philosophy series. Dolf Sternberger und Jürgen Habermas entwickelten das Konzept des Verfassungspatriotismus als Antwort auf die Situation der Bundesrepublik nach dem Zweiten Weltkrieg: Als alle Formen des kulturell oder ethnisch motivierten Patriotismus diskreditiert waren, plädierten sie für die rationale Identifikation mit den universellen Werten und Prinzipien des Grundgesetzes. Ist diese Form des Patriotismus in der postnationalen Konstellation, in der National-staaten durch Migration kulturell vielfältiger werden und in der politische Kompetenzen auf supranationale Staatenverbände wie die Europäische Union übergehen, in der Lage, Solidarität und kollektive Identifikation zu stiften? Dieser Frage geht Jan-Werner Müller in seiner präzisen ideengeschichtlichen Rekonstruktion nach. 2. Verfassungspatriotismus theoretisch: Nation ohne Eigenschaften? *Die englische Originalausgabe dieses Buches erschien unter dem Titel Constitutional Patriotism bei Princeton University Press (2007). Der Autor hat den Text für die deutsche Ausgabe überarbeitet. Jan-Werner Müller is Associate Professor at the Department of Politics, Princeton University. He directs the Program in the History of Political Thought at the University Centre for Human Values. "Über die Fortschrittsfähigkeit unserer Gesellschaft"
Sebastian Dörfler reports on the interview in his blog in "der Freitag": "Liebe als Rest-Utopie: Honneth über das Erbe der kritischen Theorie". This collection of essays combines discussion of abstract questions in moral and political theory with attention to the normative dimension of current social and political controversies. 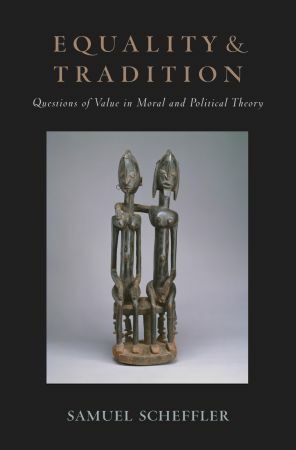 In addition to chapters on more abstract issues such as the nature of human valuing, the role of partiality in ethics, and the significance of the distinction between doing and allowing, the volume also includes essays on immigration, terrorism, toleration, political equality, and the normative significance of tradition. Uniting the essays is a shared preoccupation with questions about human value and values. The volume opens with an essay that considers the general question of what it is to value something - as opposed, say, to wanting it, wanting to want it, or thinking that it is valuable. Other essays explore particular values, such as equality, whose meaning and content are contested. Still others consider the tensions that arise, both within and among individuals, in consequence of the diversity of human values. One of the overarching aims of the book is to illuminate the different ways in which liberal political theory attempts to resolve conflicts of both of these kinds. 5. Is the Basic Structure Basic? 9. Is Terrorism Morally Distinctive? Samuel Scheffler is Professor of Philosophy at New York University. "Cohen, Justice, and Interpersonal Justification"
"G. A. Cohen had a great insight into the requirements of egalitarian justice: that claims of justice must be interpersonally persuasive within the community subject to those claims. He used this insight to criticize Rawls's Pareto-based justification of income inequality. In this paper, I argue that the idea of interpersonal justification lies at the heart of contractualist theories of justice. However, Cohen's use of this idea to criticize Rawls's difference principle borrows a luck egalitarian premise -- the claim that accidental inequalities are unjust -- that cannot be vindicated from an interpersonal stand-point. In addition, Cohen did not consistently follow through on his insight, and indeed explicitly rejected it in advancing his own idea of what justice is. I argue that most of the disagreements between luck egalitarians and contractualists that Cohen articulates can be traced to an underlying disagreement over whether justification in matters of justice is essentially interpersonal, or rather appeals to impersonal claims about the desirability of particular states of the world." Elizabeth Anderson is Professor of Philosophy and Women's Studies at University of Michigan. She has a new book coming out this fall: "The Imperative of Integration" (Princeton University Press, October 2010). 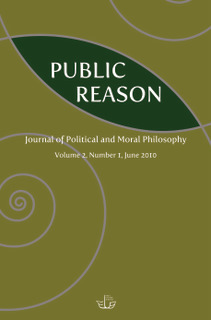 New issue of "Public Reason"